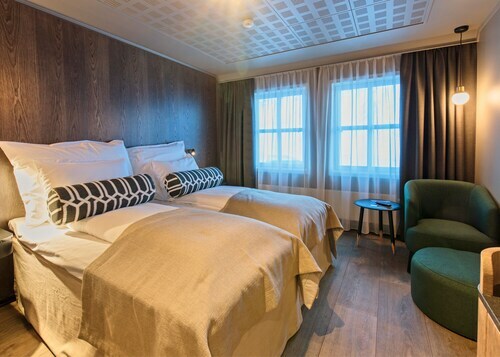 Now that you've decided to travel to Svalbard (all), ebookers would like to assist you in finding a hotel that will suit your needs. Our site speedily pulls up the top hotels in the city providing you with a wide variety of options to pick between. We offer various useful tools that you can use to quickly and easily filter the results of your search. One convenient element of our site is our map, which offers you an easy way to pinpoint a specific area for your stay in Svalbard (all). You can adjust the filters to sort by area or popular location to identify accommodation near to the city's top sights. If you're searching for hotels in a particular price range, select the price per night box to find a cheaper hotel that works best for you. 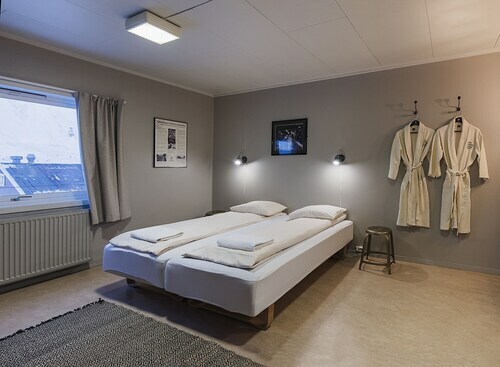 If you'd like services and facilities like free breakfast or luxury toiletries, you might choose to narrow your search so you have the comforts you want to make sure your trip to Svalbard (all) will exceed all of your expectations. We're interested in helping you work out how to get to your destination now that you've located your ideal Svalbard (all) hotel. Our site can be your first stop for all your air travel and hired car needs. You can narrow down flights by airline, airport location, or departure time to identify one that works best for you. You may also want to think about how you'll get around once you get your feet on the ground in Svalbard (all). One option that's available to you is having a car at the airport when you arrive by searching through our car hire deals. 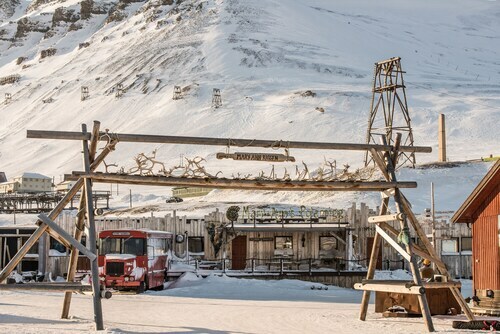 While you're in Svalbard (all), you may want to make time for some outings to explore things of interest in the area. Arranging a car hire is a good solution for travelers who want to make day trips practical so you can make sure to experience all that Svalbard (all) is best known for. Planning for your holiday in Svalbard (all) has never been easier than when you use our site. Now that you've made use of our hotel filters to find accommodation close to popular sights, it's easy to find activities nearby. From walking tours to dinner cruises, you can scan our website for Things to Do. We know that it can be difficult to find something to please the whole family, but you can filter your choices on our site to pick activities that everyone will enjoy. You don't have to go to third-party sites to see photos of activities that interest you, just click through the gallery to help make your determinations. If earning travel rewards and upgrades appeals to you, you can book through us to make the most of your budget. The only thing left to do now is enjoy your time away. Svalbard oli mielenkiintoinen. vastakohtien paikka. Pieni yhteisö, Talot seisoivat paalutettuina ikiroudan vuoksi. Aurinkoisina päivinä valo oli ihmeellinen. Meri safari Isbergenin vuonolle oli huikea. Näin ensimmäisellä retkelläni mintunvihreän jäätikön, unelmani joka vei tälle matkalle. Emme päässet ahtojään vuoksi sitä lähelle, mutta tämäkin riitti. Oikealla oli kuuluisan metsästäjän Hilmarin rakentama palatsi, vasemmalla kummallinen vuorimuodosrelma; ikäänkuin ihmiskädet olisivat siitä tehneet patsaita, pylväitä jne. Näimme vuorensein'män, jossa sadat pikkulinnut pesivät. Huskysafari vei mukanaan. Nämä intoa pursuvat koirat rakastavat vetämistä, ruokaa ja ihmistä, tässä jätjestyksessä. Saimme siitää koirat tarhalta autoon, autosta ylhäällä vuorella rekien eteen. Se kysyi kuntoa! Sain ajaa, jarrutelle vetokoiriamme,kun perässätulevat rynnivät tappelemaan meidän ykkösvetäjän kanssa. Yksinkertainen sightseeing toi runsaasti tietoa mm kaivostyöläisten merkityksestäpaikkalle. He ovat Spetsbergenin rakentaneet. Kaupunkikuva on rauhallinen, talojen värit rauhallista mattaväriä. Mielenkiintoisin pub-ravintola on Kroa, se on edullinen, hyvä tunnelma. Sattui Helluntai; norjalaiset ovat tapauskollisia, kaikki seljettu 2: päiväksipaitsi urheiluvälineliikkeet. Erikoisuutena oli jääkarhu kirkossa! Kaikki retkille osallistujat olivat iloisia ja seurallisia,aina löytyi seuraa lounaalle tai pävälliselle. Hotel okay, Zimmer recht klein und Frühstück karg wie die Landschaft! 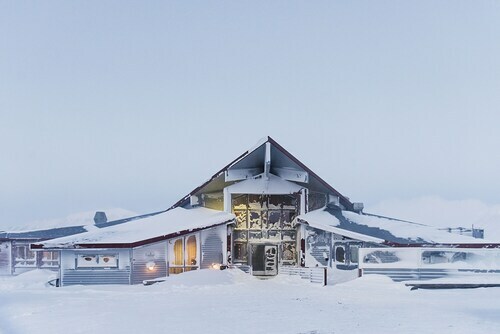 The hotel is in Nybyen, just outside of Longyearbyen but easily within reach of Longyearbyen centre, surrounded by 3 mountains and with less light pollution. I chose it in case there was a better chance of seeing the northern lights but it was cloudy the whole time so I can't confirm this. The room was basic and with a shared bathroom but clean and with friendly staff. It's served in the same way as all other hotels by the airport bus and the tour group pickups. Whilst I was in the restaurant we were all treated to a free palaeontology lecture! If my Norwegian was better I could have understood it but the slides were interesting. All in all a good stay and I'd thoroughly recommend it.